It's been so long since I last posted. Mostly that has been due to the great weather we've had in Atlanta as of late. After the miserable winter, I've been spending a lot more time riding my bike than maintaining this blog. Not to fret though, I am as enthralled as ever with architecture and design and this blog will live on. With all the riding, I'm soaking up tons of great architecture and landscaping along the way. Which, of course, means more posts in the Ride-by Architecture series. As I've mentioned before, I generally structure my routes around the neighborhoods and particular houses I want to pass by. Regardless of the route I select, I virtually always ride through sections of Peachtree Battle. It's my favorite neighborhood and is chock full of wonderful architecture and landscaping. I almost wonder if it's a requirement to have a heightened appreciation for design to live in the neighborhood. Everyone there seems to get it and invest in maintaining and enhancing the overall beauty. One of the many houses in the neighborhood that I'm quite fond of this one. For a long time this house didn't speak to me. Now, however, it sings to me. I've completely fallen for this house and can't pass through the area without catching a glimpse. If only I had fallen sooner, though. 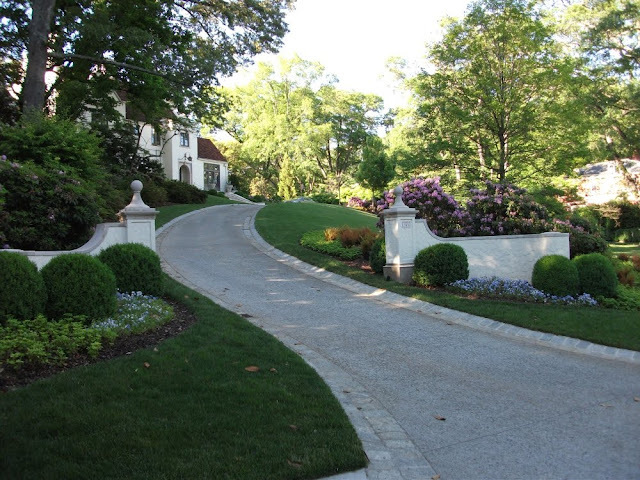 Last year the house was open on one of Atlanta's many Springtime house tours: Buckhead in Bloom. I did go inside and I also explored the grounds during the tour, but because I wasn't so taken with the house then, I didn't study everything as closely as I now wish I would have. Reflecting on it, it's really no surprise that this house has grown on me so much. It embodies many characteristics that I have a penchant for. First, it's white. For whatever reason, I'm always drawn to white houses. I think it has to do with how they gracefully stand out against a verdant landscape. I also just like the purity and simplicity of white. Second, it's from the 1920s and exudes that classic sophistication and charm that so many of the houses from that era do. The use of real materials applied to classical architecture with proper scale is the recipe for perfection in my eyes. And this house has the recipe aced. Third, the landscaping is tastefully and beautifully executed. The large expanse of dark, green Fescue grass that makes up the front lawn draws you in and is thoughtfully embellished along its perimeter with both lush plantings and timeless hardscape. 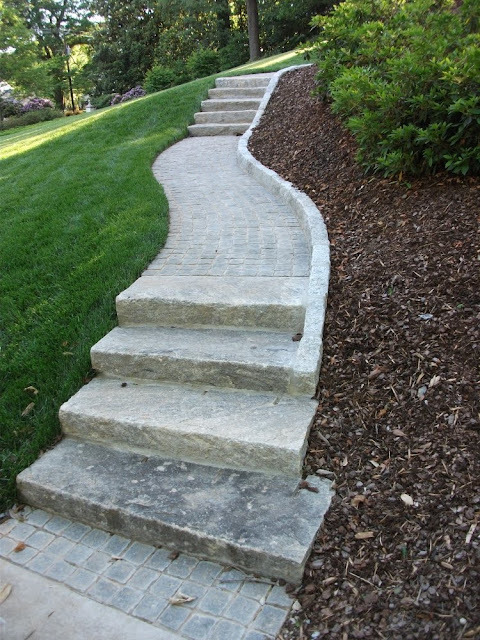 One such example being the cobbled granite walkway shown above. 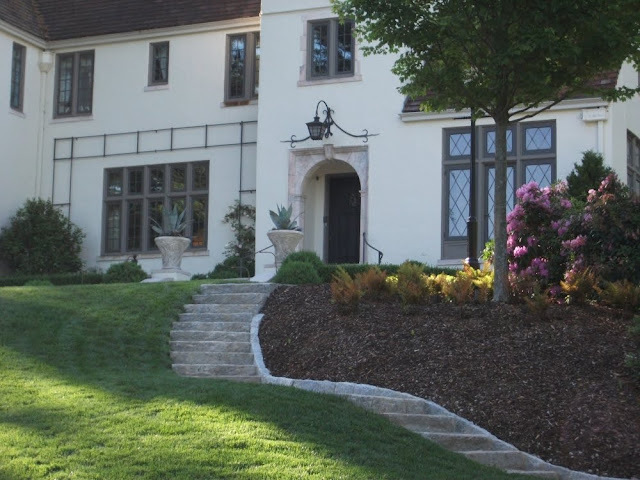 I've said it before and I'll say it again: landscaping makes the house. In the photo above you can see some of the interesting architectural embellishments the house has. This is a side shot of the porte-cochere that you can see in my other photos of the front of the house. The marble entry way. I have an affinity for entry ways adorned in limestone. While not limestone, the look is effectively the same here with the use of marble. The marble has pink undertones and was presumably selected to match with the red hues of the tile roof or perhaps for its interplay with the cream colored stucco. The leaded glass windows with the diamond pattern. I'm always drawn to these style windows. The limestone ball finials adorning the front and rear entrances. 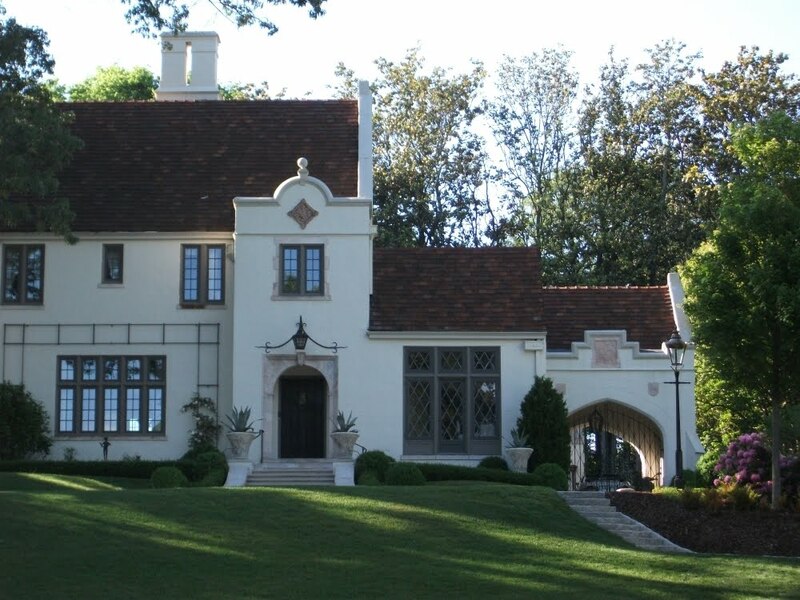 Atlanta has many houses with ball finials and I have come to love them (when carved from limestone, of course). The green-ish gray hue of the window cladding. The color is a perfect complement to the white facade and I much prefer it to window trim painted white. The clay tile roof. This house clearly has English bones, but the white stucco facade with red clay roof kind of gives it a Mediterranean feel to me. Somehow it just feels right though and is quite enchanting to observe in person. Because the post started with the front entrance to the house, I will fittingly end it with an image of the rear entrance. The structure beyond the back gate is a pool house and I believe is a new addition within the last few years. 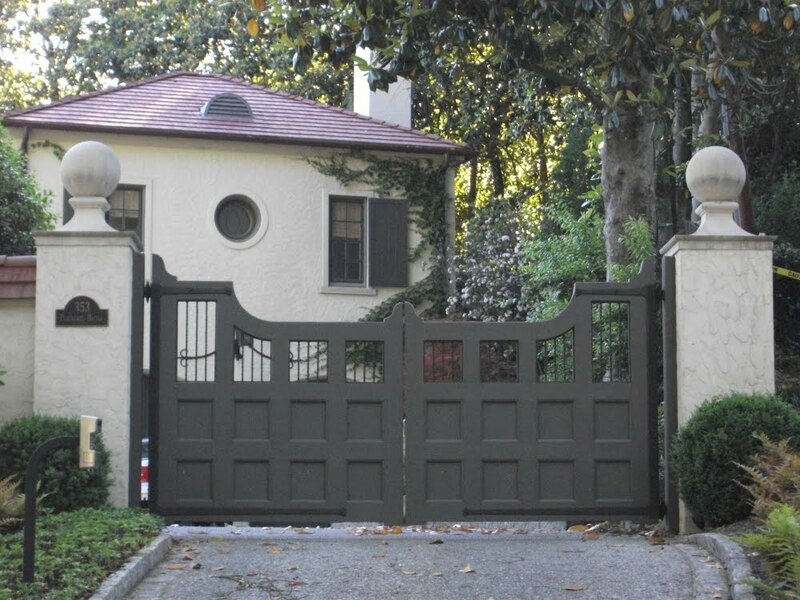 You can see the gray paint was carried over to the gate and shutters in this picture. I had intended to include a bit of the architectural history of this house from the 2009 Buckhead in Bloom house tour pamphlet, however, I seem to have misplaced my pamphlet. If any readers know the details, please do leave a comment or send me an email. I have tried contacting the Atlanta Preservation Center that puts on the Buckhead in Bloom tour to get the details, but they haven't gotten back to me. One last thing. 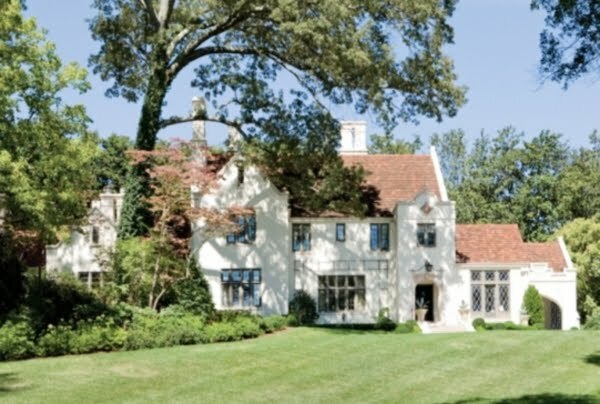 This house was included as one of the 20 houses in Atlanta Homes & Lifestyles' The Luxury of Timeless Style article. Many of my favorite houses were in that article. Their photo, taken by Erica George Dines, gives you a more realistic view of how the house looks on a typical sun-drenched day in Atlanta. The red hues of the roof read much different in Erica's photo than in mine. This is such a beautiful home and setting. I am fortunate to walk my dogs daily down Peachtree Battle and enjoy all the wonderful examples of architecture. Thanks for the great post! This house was on the Peachtree Battle tour of homes a few years ago, and although I liked and appreciated the house very much, it was the pool house that really captured my heart. It was light and airy, beautifully designed and decorated in neutral tones with accents of soft color. The architecture was by Yong Pak, and the interior design was by Gretchen Gilstrap Edwards. I believe that the pool house was featured in AH&L last year. Glad your are back on your blog circuit. I've never paid attention to this one. Peachtree Battle always has more that I can take in. I'll have to find this one. I like the asymmetry, and how it rambles in height and plan. It seems to move. @Ken Lemm: Thanks for stopping by. As you probably know, I'm quite fond of you all's work. @Things That Inspire: Thank you for the heads up on Yong Pak doing the renovation design. I will have to flip through my AH&L issues to find the pool house article. I'm sure I saw it, but had forgotten about it. 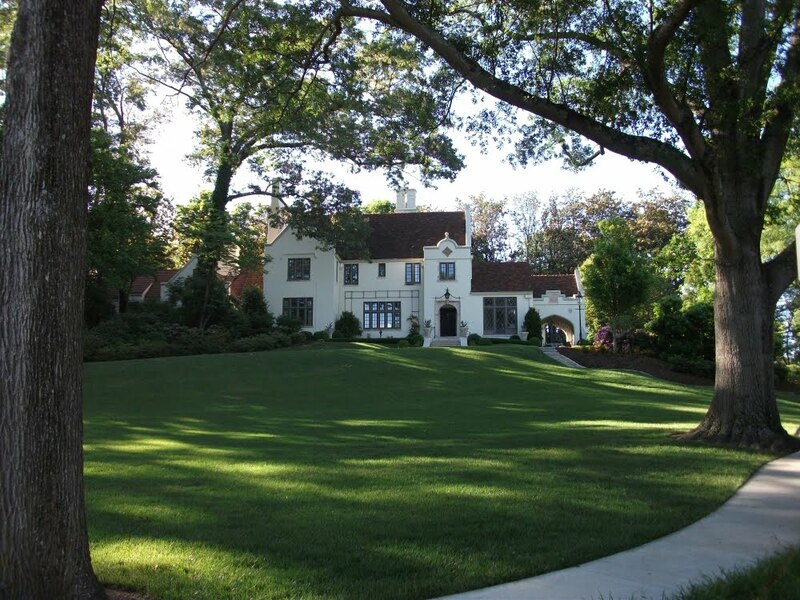 @Terry: The house is hard to miss if you drive up Peachtree Battle. It's on the corner of Dellwood. You're dead on with the asymmetry and rambling heights. I especially like that too. What works as an outside colour of a house is an interesting subject. Bright white in most of the UK just looks horrible! The lighting here just can't take it. It was the same when 'mediterranean' YSL blues became popular they just don't work here. What I call 'mudgy'colours are more successful. Those colours with the edge taken off them. I suppose thats why Farrow & Ball colours sell well. Glad you've started posting again. Dear James, good heavens how your followers have grown by leaps and bounds! Obviously a well written blog will garner followers despite how often you post, your posts are full and gorgeous, and we await the next no matter how much time between. I love this residence, too, great landscape flow with the crispness of architecural attributes, very harmonious, thank you for the post. Just beautiful. Glad your riding and blogging again. @ZoeB: Interesting topic about how color has different feels to it based on where in the world you're located. I too like many of those neutral mudgy colors you mention. @Tina: Thanks for the kind words. Gosh I am glad you're back, I've been meaning to email and tell you I missed your posts. This one certainly doesn't disappoint, what a wonderful house...I've noticed it a few times when I've been in town and over that way. It's pretty great. @ZoeB: I am totally going to start saying 'mudgy colours' now...I love it! @doug: Thanks. And agreed about the "mudgy colours" comment. I liked that too. Glad I am not alone in photographing homes that speak to me. Lovely spot. Love that first image. Oh...what a great home.. I love driving and viewing the many homes on my trips..
House spotting is one of my favorite things - what a lovely home! Atlanta is truly great resource for beautiful architecture. I really love those windows. Thanks for sharing this! This home is definitely interesting. I am usually drawn to homes that are symmetrical. This home seems to want you to take your time to enjoy it.. It has lovely details. The leaded glass windows in the harlequin pattern, but it's killing me already that I can't find another window. I would love to see how it all comes togther on the inside..
by pure chance i was looking at a site today called lease luxury properties which deals with well, leasing luxury properties in atlanta and this house is listed! 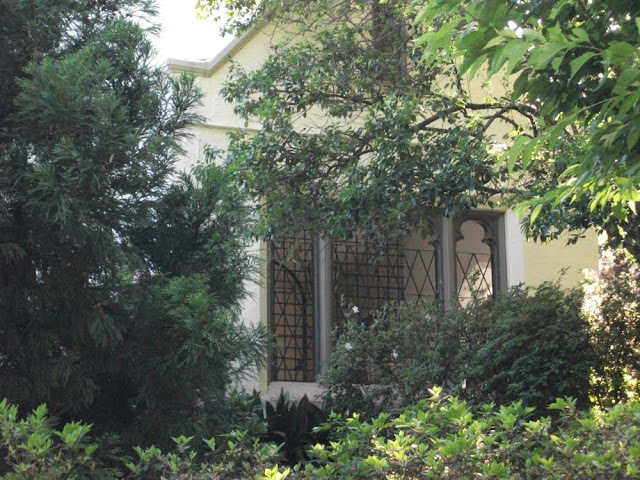 you can click on their site and go to villa dei doqi for more pics of the inside and backyard. stunning! Wow! This is crazy beautiful!! I want to go in!!! I don't know how I have missed you here in blog-land. I too ride the streets of Buckhead twice weekly out of Atlanta Cycling. It is a wonder I have not crashed while riding and trying to absorb all of the stately and beautiful homes. This Peachtree Battle home is just gorgeous. This house reminds me of wonderful Pasadena, which is full of rambling mixed style 1920's houses. People usually just stick to L.A., but Pasadena is architectural heaven! Nearly the best aspect of the lovely homes in Atlanta: the stairwell-style walkways which lead to the front door. Something rarely seen anymore.